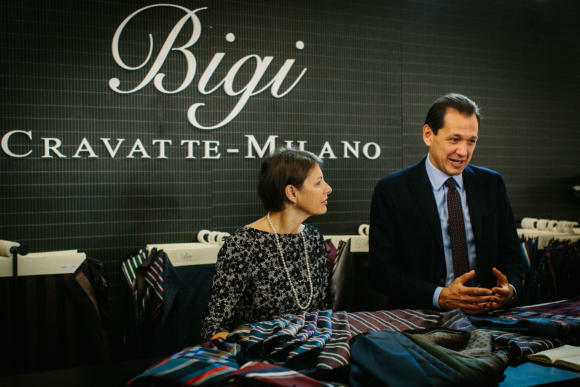 Bigi is in many ways what Drake's used to be before the expansion of its retail and collection: a small brand and a top-line tie manufacturer making for the world's top stores. 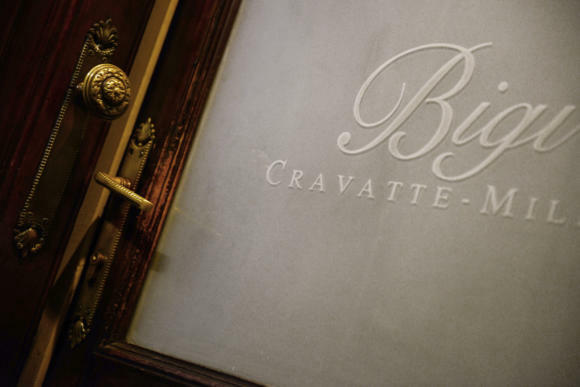 A third generation company, it has a workshop in the south of Milan run by Stefano and Paola Bigi. Twenty-seven people work for the company, with 15 based in the workshop and a further 12 outside. 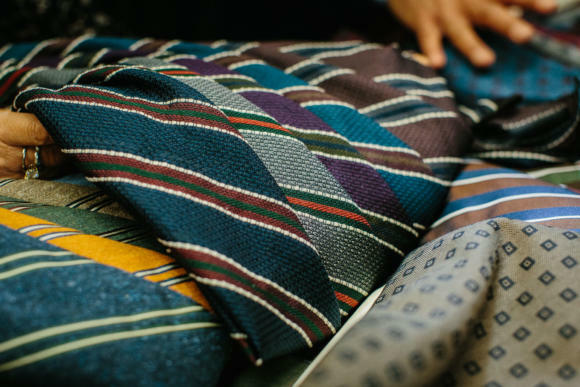 Together they produce almost 40,000 ties a year. My general awareness of Bigi was as an Italian tie brand that offered narrow ties - just because most of what I saw was 7cm, 8cm at the most. But I've since learned they make every width (up to 10cm) and importantly the width doesn't vary much in the middle of tie - which determines the length of the knot (the key thing for me). When I visited the workshop this month they had hundreds of designs on display, from big and bold to small and subtle. A particular new area for them (as well as other tie brands) is variations on the plain grenadine, such as stripes and jacquard patterns. Given there are only four looms left in the world that can do a jacquard design on grenadine, it's an obvious selling point. "So for the past two years, for example, we have been using pure silk in the tippings on ties rather than bemberg. It's a tiny thing, but it makes us happy." The workshop is beautiful, and great to have so close to the centre of Milan. Heavy doors, brass plaques and frosted glass. Walls filled with dozens of mementoes from almost 80 years in the business. 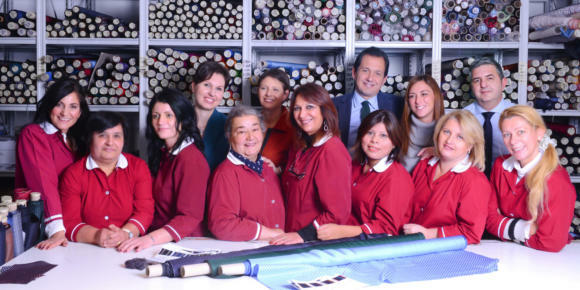 The wall of the showroom has an enormous piece of tapestry on one wall, which Stefano and Paola's mother created out of pieces of tie silk. 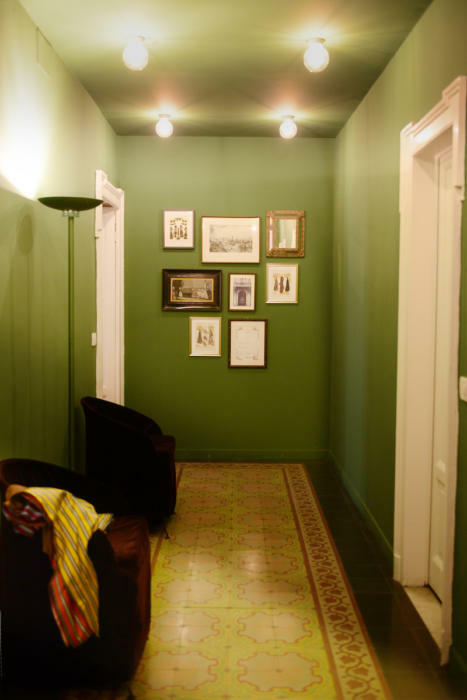 And in the hallway is a display which includes an exquisite piece of vintage silk weaving, depicting an Italian street scene. "There are maybe just four other people or workshops making ties in Milan now," comments Stefano Bigi - always the effervescent salesman, next to the quieter Paola (below). "But most of those are getting on in age now; there is one across the street who works on his own, but he doesn't really take on any new work." Stefano has been in the business long enough to recognise the virtues of ups and downs in the market. "In the nineties there were lots of neckties around, but all the product was cheap," he remembers. 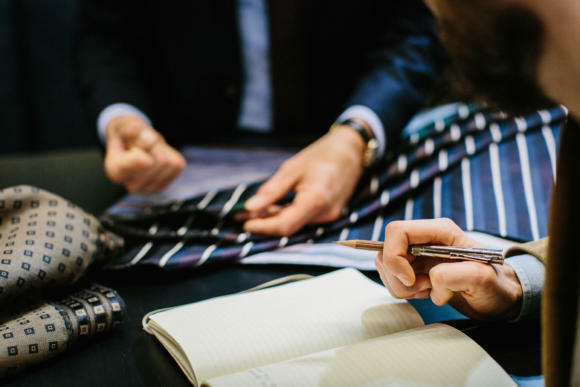 "Now it's harder to sell ties because fewer people are wearing them, but the quality and appreciation are higher. "I think I prefer it now. There are a few great competitors - like Drake's - but only a few." Oddly, Stefano says the Japanese market for ties took a big hit in the wake of the Fukushima nuclear accident in 2011. In order to try and save power, the government suggested ("effectively an order, given it's Japan") that office workers should take off their jackets and ties so they could turn down their conditioning. 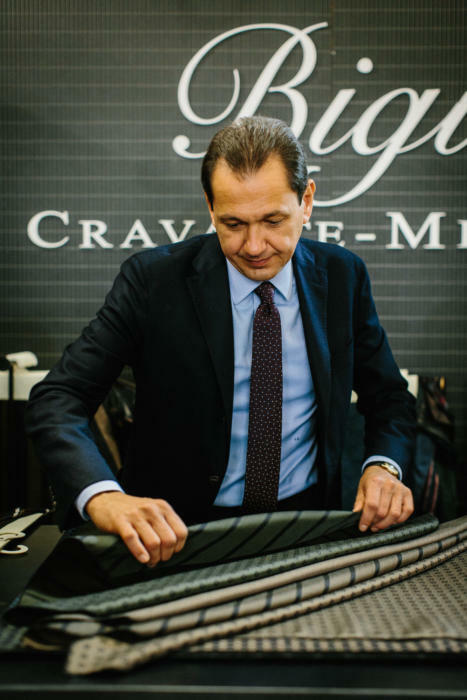 "It made a huge difference to the tie market - though thankfully not that much to us at the high end," Stefano says. "Japan used to be the one place everyone wore a tie, but not anymore." Stefano is also fond of quoting an old Italian saying about family companies: The first generation creates, The second continues, The third destroys. "I only like it because hopefully Paola and I are proving it's not always true!" he says. Although Bigi makes for United Arrows, Tomorrowland, Barney's and many others, many of the ties are under its own label. Bigi ties are also sold at No Man Walks Alone, Trunk Clothiers and Selfridge's. You can follow the discussion on Bigi ties – Milan workshop by entering your email address in the box below. You will then receive an email every time a new comment is added. These will also contain a link to a page where you can stop the alerts, and remove all of your related data from the site. Completely offtopic: You have stated several times that you would find more hand steps in a neapolitan trouser than in an english one. I would like to know which parts of the trouser are handmade in one made in the Row. And how the french compare with both tailoring schools regarding handmade steps? Another interesting thing, but maybe for a full post, would be to compare different patterns/cuts regarding trousers. Simon, great discovery. They are walking distance from my home and I have never heard of. Any indication on the range of prices ? Thanks Simon! Looking forward to your post. 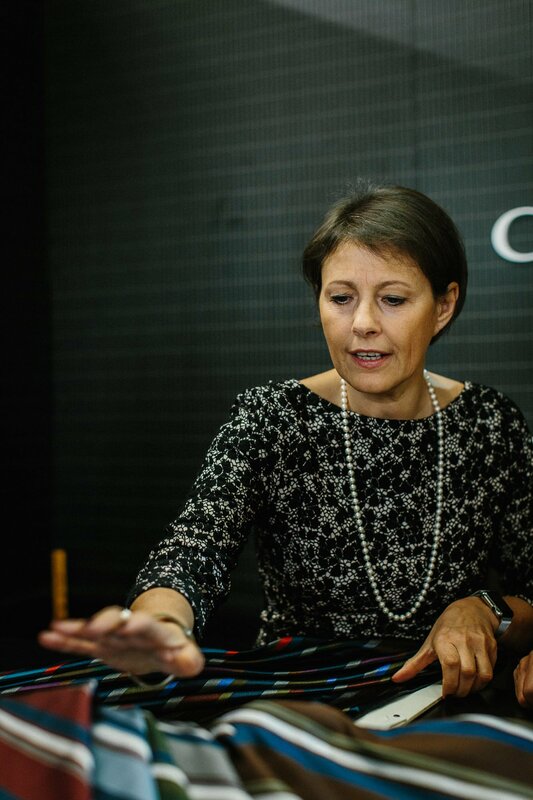 Wonderful photos, thanks — especially the table of stripes from Pitti. One question about variety: do you still buy new ties, and if so, do you have to go out of your way in order to wear them? I ask because while I don’t have a huge collection, I still find 75% of the time I’m wearing the same three or four: a couple of grenadines, a block stripe linen/silk and a cashmere solid herringbone. That said, these striped grenadines look great, and pretty versatile. Great ties. Bought my first from Trunk in 2011, even though they did not had a web shop then. Thanks to great customer service, I could buy the tie from Sweden. Now I have six Bigi ties, all purchased from Trunk. A nice introduction. Unfortunately, Bigi’s website is still under construction. I would really like to know where I might be able to take some of my ties so that I can have the width on them slightly reduced. I’m 5ft 6 and I find that some of my older ties look too fat when I wear them. Would you be able to tell me where I could take them to please? I’m just looking to pare them down a little to 8-8.5cm. I’m afraid this is not easy Shams. It’s not like an alteration on tailoring, it’s essentially remaking the entire tie. Only a real tie workshop would be able to do it, and it wouldn’t be much cheaper than buying a new tie. I’d probably recommend selling off the old ones and buying new ones. 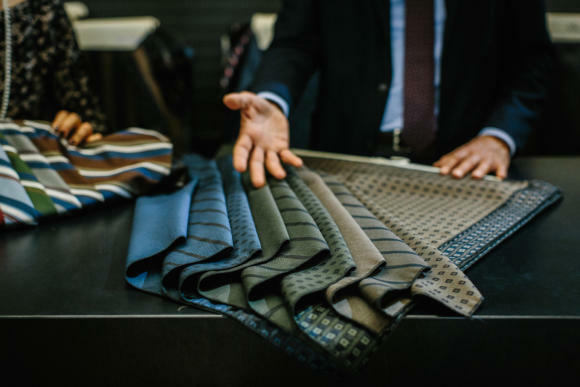 In New York there is a service called Air Tailor that specializes in reducing the width of ties. I’ve never tried it though. If you are in the New York area maybe you can try it. 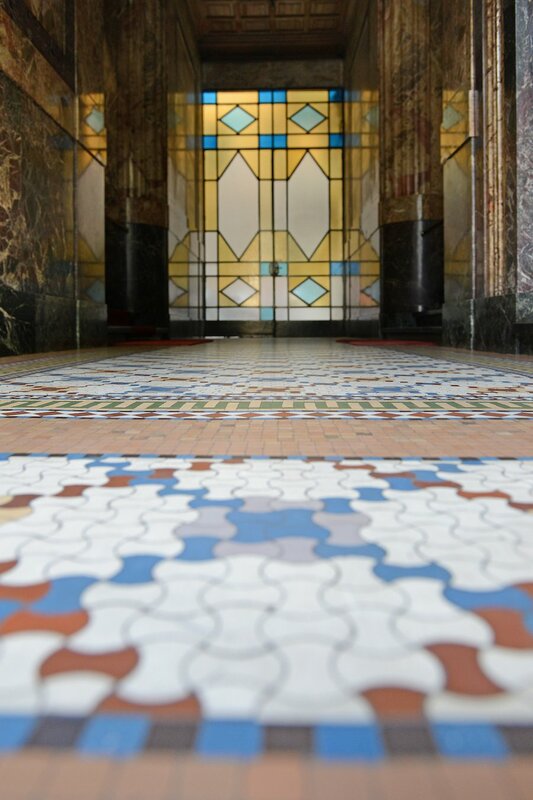 are you planning any articles about the upcoming openings of J. Girwood and Anglo-Italian Co. or will you cover this when they’re up and running? I am very excited about these two contributions to men’s fashion. living in Zurich I have the advantage of beeing in Milano in three hours. I have not only bought traditional Marinella ties but also more modern ones from AD56. The shop owner wears them very casually, the thin end hanging well below the belt. I’m not sure, where the thin end of the tie belongs: stuck in the trousers or loose in the air? Or are these ties simply too long for me with 178cm height? I like your column, great column, wonderful column – the best.. So my question is, how many pieces of tape do you recommend to hold the short end in place, and is there a brand of tape that you think is best to use? They’re working to an average of guys, and generally assuming a tight four in hand knot. A US reader has just alerted to me to the Trump reference… oh dear oh dear. My question then, is it safest to select ties a little over 3 inches in width, and you are likely to be acceptably in style most of the time? Yes, as with many things if you avoid extremes you’re more likely to avoid pieces falling out of fashion. Simon, in regards to fabric for ties. Do the likes of Ferragamo and Hermes make their own fabric or do they source it, and if so, who are the mills that supply tie fabric? They are similar to each other in terms of look and feel, even pattern in some cases, but distinctly different to say a Drakes tie. Hermes makes some of its own silks, Ferragamo does not. 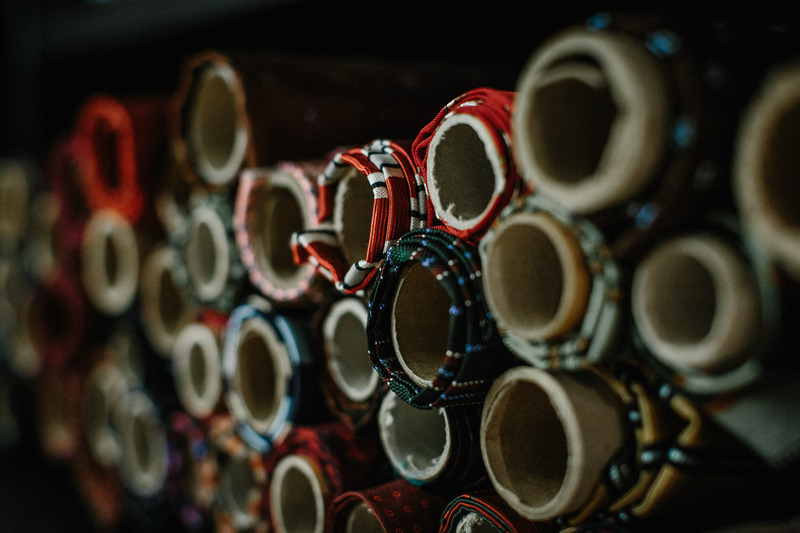 I can cover silk mills separately, but in most cases the reason they are similar is not to do with the particular mill they come from – more just the aesthetic they are looking for. Hermes has become very know for that bright, playful printed silk, but they are by no means the only brand that has done a lot of it. Ok thanks. So in terms of the feel, is this the quality of the silk? And do they have different grades, as a worsted wool would? Fineness, as you would have it a worsted wool, is not so important no – it is more about aesthetic effect you are trying to achieve. What goes into creating that effect, from the silk itself to the finishing, is quite a big point and deserves its own post at some point. You previously wrote about the smartness/formality of ties. Can you advise on how, within the same kind of fabric, the weights of the silk and interlining, as well as the construction (3 fold v. 7 fold v. unlined, etc.) affect the drape/fall, knot and tie arch? Maybe this begs a separate post. Speaking of only pure silk ties for instance, my Hermès tie gives me the most beautiful and reliable knot (however I find most of their patterns unwearable). The lightweight silk and interlining of the Bigi give me a winsome knot and the tie comes alive with the gentlest hint of a breeze (a characteristic I absolutely love). My Drake’s ties are gambles on each of these aspects. And the multifold Kiton and Isaia have the softest handle but tend to be very grounded. I tend to wear trousers at my natural waist. If the front blade of the tie ends at my waistband, the rear blade hangs far lower, almost near the hem of the jacket. Tucking the rear blade in the trousers just appears off balance. What’s the solution? Yes, that definitely deserves a separate post. Briefly though, the weight of silk and lining will obviously affect how the tie falls and moves – any lighter combination will move more. The thickness of the knot is then also clearly determined by the combinaton of silk and lining, and this is something you can feel yourself when you feel the tie. However, I would avoid generalising too much across brands – as you allude to, Drakes ties vary in their weight and construction, so you can’t be consistent there. The arch of the tie is due to a much larger group of factors, mostly the shirt collarband, its height, angle and relationship to your neck. Having more friction in the tie silk helps, but it is only one factor. I had the pleasure of working with Bigi for a number of years. Stefano and Paola make beautiful ties and operate their business in a most professional manner. Would you say the lack of width variation in the middle of the tie means you can stick to 8cm at the tip, or would you still recommend 9cm from Bigi if doing MTO?